The Bing cherry is a favorite but other varieties (such as the Rainier & the Queen Anne) are gaining in popularity every year. 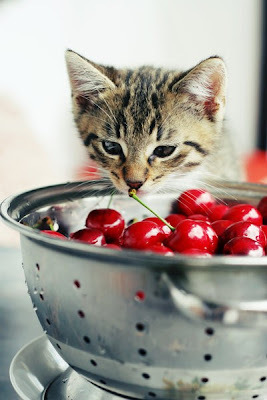 Life may not be a bowl of cherries, but few things so simple can make people so happy. Even Giulia is enamored of this stone fruit, much like her comrade-in-fur in the photograph. Here are more cherry recipes than you probably know what to do with...that Martha, she's on top of it, as usual. Remember to visit the new litter of kittens at the Itty Bitty Kitty Committee. We're down to the last week of the fundraiser & there are treats galore waiting for you. Following a litter of kittens from their shaky start to their adoption is a good thing. Trust us.